6th in the popular series of offical Action Packs for Advanced Squad Leader. 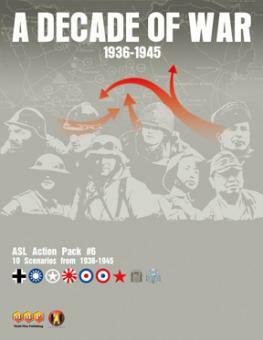 "MMP has reached an agreement with three ASL legends to produce a new Action Pack. AP6—The Decade of War—will have three new mapboards and ten scenarios using them. When talking ASL, Gary Fortenberry, Charlie Kibler, and Bob McNamara need no introduction; all three were major figures in ASL at The Avalon Hill Game Company before MMP took over ASL development. The new mapboards—based on a concept that Gary has been toying with for a number of years—resemble two half-boards placed side-by-side and allow new mapboard configurations not possible before. The scenarios consist of a battle a year for the ten years 1936-1945 and feature the combined research and design skills of Fort, Charlie, and Mac."